Studio on the first floor of a villa (multi unit) facing the sea just a few meters from the beach. Music and fun day and night. The studio is reserved for couples. It has a beautiful balcony. Area 35 square meters, a kitchenette with electric plate and microwave. Bathroom with shower, air conditioning, free wi-fi. Double bed plus single bed. 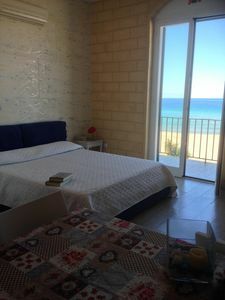 Studios particularly suitable for couples, on the beach of Terrasini, in a place full of entertainment, fashionable venues, music and party every day! Just 10 Km from Palermo Airport, in an extremely convenient location to reach many famous locations. The sea is very nice, transparent water, beaches and cliffs. The studios are practical, adapted to the needs of a couple. There is air conditioning and wi-fi.